African Rock Python Gets New Home! 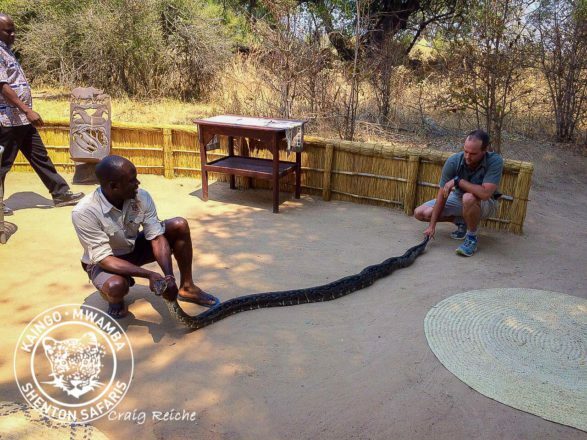 For the past few months we have had a rock python living in its hole near the Last Waterhole Hide at Mwamba Bushcamp. Peter (or maybe it should have been Petra), had a very comfortable spot near the waterhole, which we are sure supplied him with some very good meals! Rock Pythons are not classified as a dangerous snake; they are nonvenomous and use constriction to kill their prey. One could easily tell that Peter was more scared of us than we were of him as whenever someone came to visit the hide he would rush back into the safety of his hole. Sadly snakes are not always a very well received animal, harmless or not, and with more and more people viewing Peter and with him liking to sun bathe near the entrance to the hide, we felt we needed to relocate him to a better, more quiet, home. Thus began the process of being able to move him peacefully. 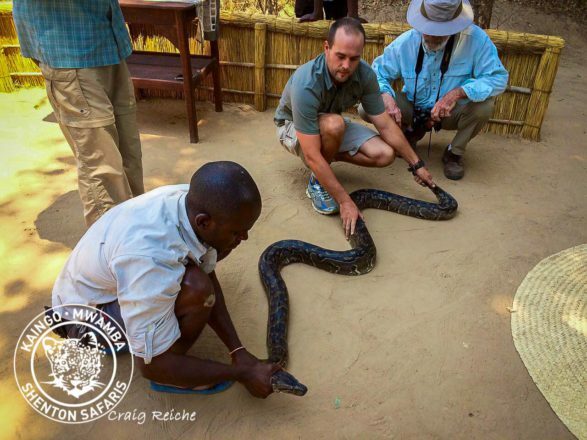 Craig, Mwamba Bushcamp Manager, has done snake handling courses and has moved many snakes during his time in the bush. Due to Peter’s large size (approx. 3m) this couldn’t be a one man job, so Andrew, our guide ,stepped in to assist. Luck was with us a few days ago as Peter was sunbathing out in the open. Craig and Andrew managed to pick Peter up and carry him away from the hide. This presented a lovely educational interaction with our guests, who got to witness the process and take photos. Our guests were able to feel the python and view its many battle scars. Peter had just finished the sloughing (shedding) process and had a beautiful new skin. We were also able to view the reptile ticks which, as the name indicates, are only found on reptiles. As you can see from the video below, Peter looked quite content in his new home and immediately began exploring the termite mound and climbing the python vines, which we found very fitting given the name.